Garden Fresh Gazpacho is a perfect cold soup for a hot day. It’s easy to make and a great way to use all those wonderful summer vegetables from your garden or farmer’s market. If you are a gardener, chances are that by the mid-point of summer, you have an abundance of vegetables in your garden. Right?? You may even have picked so much delicious produce that you ran out of ideas of what to make with them. Why not change things up a little and make this healthy Garden Fresh Gazpacho. Gazpacho is a cold, tomato-based soup that is popular in Spain and Portugal. 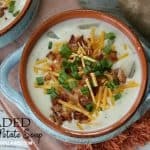 It’s a perfect soup for summer for two reasons – it’s served cold (who wants to eat hot soup when it’s 95 degrees out??) and it’s a good way to utilize those wonderful vegetables you just picked from your garden or bought at your local farm market. Another bonus….you don’t have to turn your stove on and heat up the kitchen, especially during the hot summer months. This soup is uncooked and prepared from raw vegetables. While I am not a doctor or dietician, I would consider this pretty healthy too. It’s made from raw vegetables for goodness sake! We are in the midst of summer’s bounty here on our farm. I love when all our fresh produce is in season. I raided our fields for most of the ingredients for this delicious recipe. I should probably call this Jersey Fresh Gazpacho! I first finely chop up the vegetables and place them in a food processor . I used tomatoes, celery, onion, jalapeño, and zucchini. I also saved some of the chopped vegetables for garnish and to mix in the soup before I serve. Give the food processor a couple of pulses so the gazpacho is chunky, not smooth. Don’t over process. Transfer the soup to a storage container and refrigerate at least two hours. The longer the better because the flavor develops more over time. Once the soup is ready to serve. I dish it out and add the remaining vegetables that I saved. I garnish with fresh corn, diced avocado and a nice dollop of sour cream. 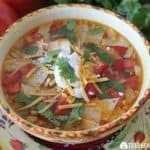 I love the cool and hearty taste of this soup. The vegetables work well together and have the perfect crunch. The jalapeño and cilantro give the gazpacho the right amount of zing. Garden Fresh Gazpacho is a delicious light meal option. It goes well with a nice side salad on a hot summers day. No cooking or heating up the kitchen involved. Garden Fresh Gazpacho is a delicious summer soup made with fresh garden vegetables. 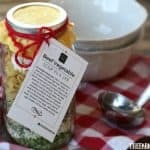 This recipe is super easy and a great way to use up all the vegetables from the farmer's market or your garden. In a food processor, add tomato, canned tomato. celery, red pepper, onion, cucumber, zucchini, garlic, jalapeno (to taste - if you like heat, then add more), cilantro, salt, pepper and cumin. Pulse the food processor so the gazpacho is chunky but all the vegetables are combined. Transfer to a food storage container and refrigerate at least two hours. To serve, garnish with fresh corn, avocado and a dollop of sour cream. Dear Melissa, you do know how to tempt me. Love me some gazpacho with fresh garden veggies. Yours is perfection! Hey, Melissa! This is perfect timing. I lost my roasted red pepper gazpacho recipe, so this will come in handy. Thanks! I don’t think I’ve ever had gazpacho before. But I love every ingredient you listed, so I’d probably really enjoy it. I love gazpacho, but never think to make it. Now I am thinking I need to go shopping to buy the ingredients. this soup looks fabulous! i wish I had a bowl for lunch today! Pinned to my Recipes To Try Board & sharing onmy P3party Post Tomorrow! So look for a little traffic from me! Apparently I can not type today! Lol! Have a great weekend! I wish I had your garden. 🙂 There is nothing better than a homegrown tomato. Your presentation is so appealing.